Washington is one of the best places to experience New England during the fall season. The surrounding hillsides and vistas are awash with vibrant color at every turn. Village greens are ablaze in color and historic buildings and homes are decorated in full fall splendor. 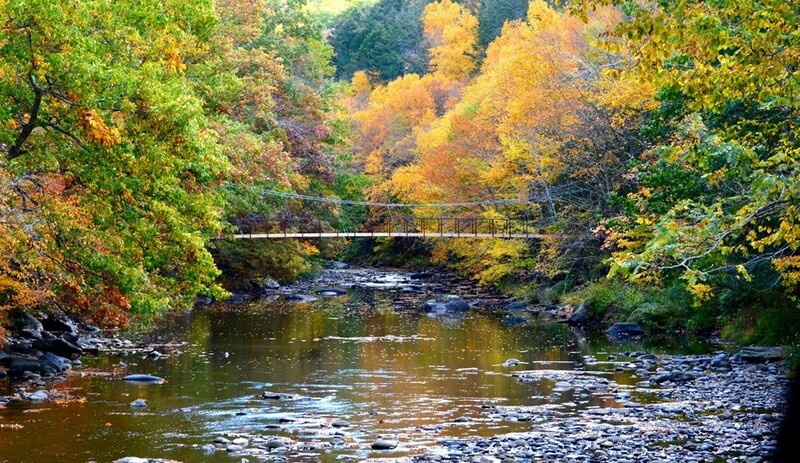 Washington, in the heart of Litchfield County, truly embraces the fall season and presents many fun and family-friendly things do in town to celebrate autumn to its fullest. As fall starts to set in, Washington’s landscapes become infused with color. The surrounding wooded hillsides are truly a leave-peepers dream, as they burst with all shades of yellow, orange, green and red. Washington’s spectacular foliage can be admired from many leaf peeping vantage points. For those who want to enjoy the foliage from within the woods and the highest pinnacles, check out the trails in our preserves and parks. 2. Pick your own – and don’t forget the donuts! A quintessential fall activity, apple picking at our very own Averill Farm is not to be missed. This lovely farm has been in the Averill family for 10 generations, since 1746! Their orchards offer 20 different varieties of apples and pears that are available for picking throughout the fall season. After you gather your apples, be sure to stop by the quaint store and try their homemade donuts and cider. You can also visit nearby Starberry Farm in Washington Depot for apples at their farm stand. On Saturday, October 21st, Washington will be holding its first annual Washington Harvest Festival. Live music will accompany many family-friendly activities such as pumpkin carving, face painting, truck rides and a hay maze. Local food vendors will offer their favorite seasonal treats to attendees and the decorative scarecrows from the town-wide contest will also be on display throughout the festival. And who won’t love to sample the yummy community-wide Dessert Contest! Also, while in the Depot, don’t miss the local bounty at the Saturday Washington Farmers Market. Hopkins Vineyard is always a great fall destination and their 8th Annual Wine & Cheese Market on October 14th is a highlight of our fall season. Explore a wide collection of boutique wines, hard cider, and locally made artisan cheeses while enjoying live music. Guests will also have the opportunity to sample a variety of chocolates, jams, olive oils, and cookies as well as browse through craft items made by local artisans. Travel back in time on October 27th and experience Washington’s rich history at the Gunn Museum’s 10th Annual Washington Green Cemetery Tour. Local guides from the Museum will be adorned in vintage attire and will lead visitors along a path of 1,000 luminaries through the Cemetery. Unforgettable residents from the town’s storied past will be brought to life at every tour stop, as costumed actors recite stories and tales from their character’s past. The Gunn Memorial Library & Museum hosts a Halloween Party and Parade for the little Washingtonians every year. Crafts and games usually begin this afternoon of Halloween festivities and then participants, adorned in their splendid costumes, get to enjoy a trick or treat parade through the library. Spend some time inside this autumn exploring art at one of Washington’s fabulous art galleries. The gallery at the Judy Black Memorial Park and Gardens will display contemporary art in a couple of exhibits this fall while the Stairwell Gallery at the Gunn Memorial Library is set to host several solo art shows this fall. The Smithy’s Loft Gallery is always a fun experience and for the fall they are featuring the art of Marisabel Artieda. Grab your running shoes and head outdoors to take part in the Steep Rock Trail Series, where runners can enjoy the magnificent foliage and beautiful views of the Steep Rock Association’s natural preserves. Runners will progress up to a half marathon by the end of the third race. For these who are new to trail running or just want to take in the scenery, each race will also feature a 5K option. For those who prefer a more modest pace, take a leisurely hike at any of our trails or nearby state parks. Whether you are looking for a fashion forward statement or a unique decorative accent for your home, the shops of New Preston and Washington are the perfect destination for a fall shopping spree. Our world-class shops feature highly curated products that offer up a welcome antidote for dreary big box shopping. And where else can you stroll through picture-postcard villages while scoring your next big find? Washington’s restaurants are known for innovative farm to table menus – and fall is the season for harvest bounty. Our restaurants and classic New England taverns serve up the best of local fall ingredients such as butternut squash, pumpkin, pears, and apples and a plethora of local veg. Our cafes and gourmet shops also offer seasonal treats that range from pumpkin spice “everything” to the decadent caramel apple pie. Wine lovers will find a seasonal twist in the town’s wine bars and pubs as their menus feature a selection of the best autumn fare. Washington’s fall schedule is full of events and festivities that offer something for everyone. Check out Washington’s Featured Fall Events. We’ll see you in Washington! Photo Credit: Henry David Thoreau Footbridge in the Hidden Valley Preserve by Vi Owens.